No clue here who came up with those two sayings, but whoever it was should be working at the very expensive, sometimes dysfunctional headquarters of the Pac-12. Leadership there could use a little advice regarding the pratfalls that come with being full of yourself, feeling as though you’re always right, believing your decisions, abilities and accomplishments make you and yours better, smarter than everyone else. 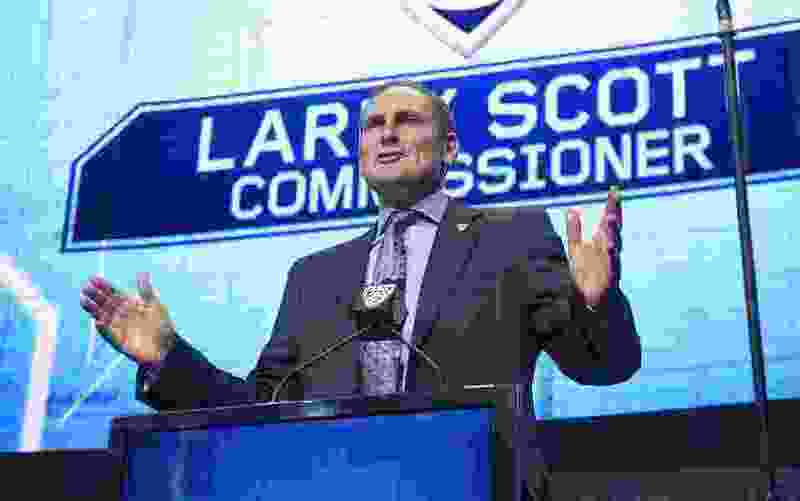 But if any one conclusive thing has come out of the recent revelations about and competitive results of the Pac-12 under commissioner Larry Scott, it is that the league has been badly mismanaged in a way that is a surprise to nobody now, except for the league leadership itself. You would think maybe Scott would have quite clearly gotten the drift when he was loudly booed by the crowd at the Pac-12 championship game last week. Fans of conference schools are not happy with him. It’s time for Pac-12 school presidents, who happen to be Scott’s bosses, to come around to the drift, too. They would if they paid a little closer attention to what’s happening at their league’s offices, researched and reported thoroughly by The Oregonian last week in a four-part series chronicling the conference’s troubles. It’s something Utah president Ruth Watkins recently tweeted out she fully intends to do. Let’s cut through the BS and say it the way it is here. The Pac-12 is lurching, certainly measured against the standard of other Power 5 conferences, on account of the aforementioned roadblock, on account of too many cocky roaches at the top. And even as such failings are pointed out and examined and reported, that leadership has responded with the same arrogance and misjudgment that caused the problems in the first place. Scott is straight whistling in the dark, acting as though all is well. He described the in-depth, well-researched Oregonian articles as mischaracterizations. Problems such as … Scott’s own lofty salary ($4.8 million), which is double what any other conference commissioner makes, the exorbitant rent paid for lavish league offices ($6.9 million), caused when they were moved to San Francisco, high travel expenses, out-of-whack expenses, in general. Meanwhile, the league office is extracting millions and millions of dollars, some $50 million in overhead, while the member institutions are making around $29 million annually, considerably less than what schools in the Big Ten and the SEC are getting. Those leagues dole out 90 percent of their revenue to their schools, while the Pac-12 awards its members just 73 percent. Much of that has to do with lesser TV dollars, the Pac-12 fiddle-faddling around with its own network, which right now is nowhere near as profitable as the deals schools in other leagues have and the cash they are getting from established network partners. The league is no closer now than it ever was in trying to get its network on DirecTV, limiting the endeavor’s reach. In addition, Pac-12 digital rights have yet to be financially maximized. Beyond that, the league has struggled with transparency issues, as administrators at schools within the league have been shutout from significant chunks of information regarding the conference’s financials and practices. It also has slogged and suffered through an infamous replay-review scandal, which called into question the Pac-12’s integrity. Other officiating controversies had arisen previously. As the conference’s expenses have increased and its profits dropped, relative to the other P5’s, the league’s success on the football field and on the basketball court, in the two biggest college sports, has also fallen, at times to an embarrassing level. Those two elements — money and wins, or lack thereof — are undoubtedly related. And as the Pac-12’s schools on the national scene — college football rankings and playoff spots, and NCAA Tournament victories — have made and won less, there are some league administrators who are wondering how and when the thing is going to get turned around. Scott said it will, that winning and losing is cyclical. More on point, management and mismanagement is cyclical. And the Pac-12, under Scott, is on a downward bend. Anyone with eyes to see or to read knows it. Where’s our money? Where are our wins? Why are we falling behind? Why are we wasting money? Why are you getting rich? Why are the other P5 leagues laughing at our troubles? Why is our integrity being questioned? Why are we dismissing the facts, calling them mischaracterizations? Are we — and by we, we mean you — really smarter, better than the people leading those other leagues? Why are we — you — thinking and acting as though we — you — are? Don’t be a roadblock on the highway to wisdom, Larry Scott. Don’t be an arrogant bug or a cocky roach. Don’t get booed by the fans of the schools you represent, no matter how substandard in intelligence you think they are. Arrogance is ugly on any leader, especially when it’s used to disguise bad decisions well on their way to getting worse.